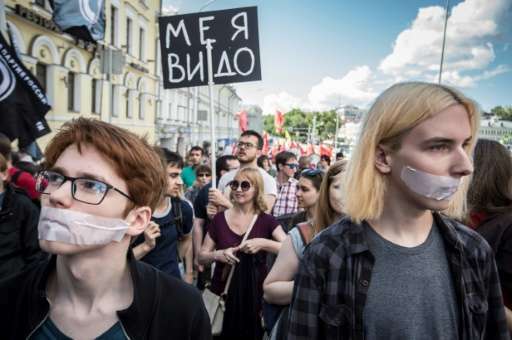 Around 1,000 people marched through central Moscow on Sunday to protest against the government's harsh legislative controls on the internet. Demonstrators at the rally, which was authorised by city authorities, shouted slogans including "No to censorship, no to dictatorship!" and "Down with the police state!" Some adapted a popular slogan from opposition rallies against President Vladimir Putin's rule, shouting "Russia without Putin and censorship!" Police said that around 800 people attended the protest, which was organised by Parnas opposition party, headed by former prime minister Mikhail Kasyanov. An AFP journalist estimated the turnout at 1,000 to 1,500. OVD Info website, which monitors detentions of political activists, said three had been detained, one for giving out leaflets promoting opposition leader Alexei Navalny. Pavel Rassudov, 34, the former head of the Pirate Party campaign group, said at the march that "restrictions on the internet began in 2011," as the opposition to Putin held mass rallies in Moscow. "The authorities realised the Internet was a tool for mobilisation, that it brings people out onto the streets," Rassudov said. Another marcher, Lyudmila Toporova, 56, said she came to the rally because "Freedom is the most important thing in life. That's why I'm here." Russia in recent years has moved to impose restrictions on internet use, blacklisting web pages for extremist content and prosecuted a growing number of individuals for posting online. Since January 1, internet companies have been required to store all users' personal data at centres in Russia and provide it to the authorities on demand. In addition, new legislation passed by the lower house of parliament on Friday would ban the use of VPNs and anonymous messaging apps such as Telegram. Protesters on Sunday highlighted the case of videoblogger Ruslan Sokolovsky who filmed himself hunting Pokemons in a church and has been placed on a list of "terrorists" and extremists and had his bank accounts blocked. The internet is one of the country's few forums for political debate and Kremlin critic Navalny has won a youth following with live video blogs and YouTube videos. Putin on Friday during a live television show with children admitted that he almost never uses the internet and does not have time for social media such as Instagram. Unfortunately state oppression will continue to increase under Putin's dictatorship. It's the same sad pattern we've seen repeated numerous times in recent history: a power-mad leader consolidates government control in himself, circumvents or even abolishes the state constitution or any regulation that imposes term limits—effectively making himself dictator for life-—then oppresses and kills his opponents in the media and restricts personal freedoms, especially freedom of expression and thought. As the freedom of the citizens diminishes so too does the economy. I sure hope Putin doesn't have allies in the US government.